(…sigh) Laughing on the outside, crying on the inside. It should be noted that this level of illiterate paste-eating chowderheadedness is not always indicated in home schooling situations. 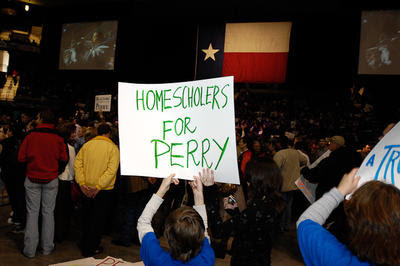 In fact, you’ll hear from a number of progressive, atheist parents on the TFN blog who have chosen, wisely, to homeschool because Texas is doing is damnedest to turn public schools here into little Christian houses of indoctrination. If I were a parent, I’d homeschool, absolutely. How else could I be sure my kid was getting a sound grounding in history and science, free from right-wing ideological revisionism? But it’s true that a significant amount of homeschooling is done by fundamentalist Christian parents seeking to destroy their kids’ minds and future opportunities by entrenching that very ideology. And I think that’s what we’re seeing the hilarious after-effects of here. Hey gang. Did you hear? George W. Bush is not the president any more! He’s gone! Out! That frackin’ miserable useless failure has joined the expanding ranks of our nation’s many unemployed! We have a new guy. I like him. I have high, but realistic hopes for him. 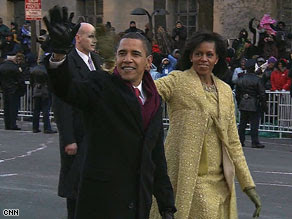 I do think there has been a bit of excess from the media hype machine about his inauguration, but I put that down to pride over the fact that the USA, with its utterly appalling history of racism, has elected a non-white president, as well as general excitement over the fact that George W. Bush is no longer the president! I’m pleased to be living in an America where the people are excited, rather than appalled and embarrassed by, our president. But go easy on the rockstar stuff. President Obama has eight years of almost apocalyptic disaster to fix. It will take time. He will have failures as well as successes. He knows how hard a row he has to hoe. I just want all of his slathering fans supporters to know that too. The higher they build you up, the longer and harder the fall you may be in for. Just remember, Obama is a man, not a messiah. I think he stands to be a better president than most we’ve had in my lifetime. But let’s keep our heads, and stay realistic. Today’s excitement aside, tomorrow we’re back to workaday. There’s a big job ahead. –Barak Obama, “Call to Renewal” Keynote Address, June 28, 2006. This quote was featured this morning on another atheist blog I frequent, Austin Cline’s atheism.about.com section. Austin makes some good points, and points most of the people who visit this blog spot would probably think of themselves. That the phrase is openly discriminatory toward atheists, and that it furthers the disenfranchisement of atheists in our culture. Let me be clear, however, that I acknowledge that the insertion of the phrase is completely in violation of the Establishment of Religion clause, and should be removed, if on no other grounds than that. Also, just because the phrase never offended me, personally, I certainly don’t take issue with anyone else feeling uncomfortable with it. How it makes a person feel is just that–how it makes them feel. It’s not wrong to have feelings or to acknowledge them. And just because I don’t share a person’s feelings, doesn’t invalidate their feelings, or my lack of them. So, it is a phrase that at the very least violates our Constitution and, therefore, our law, and also that may offend some citizens who like to think that they are just as patriotic as any theist, or that they don’t want their children compelled to say this any more than a Christian would want their child compelled to say “One Nation Without a God.”. And these are real problems. In my humble view, however, as someone who has dialogued with quite a lot of theists, neither of these things comes close to what I consider to be the real harm caused by the insertion of this phrase into our Pledge of Allegiance. What disturbs me beyond these two very real concerns? The fact that there is a group of very vocal, very politically active theists, specifically Christians, who would insert this phrase and similar phrases all over our government and our government-sponsored public institutions in order to promote the view that we are, on some level, a theocracy. The last time I was on AE, Matt Dillahunty pointed out that if a person says “This is a Christian nation,” and they mean by that that our citizens, by and large, are Christians, they are correct. If they mean by that that the vast majority of early Americans and founders of the United States were Christians or monotheists along Christian lines, they are correct. If, however, they mean by that that our laws are based upon the Bible, and that Biblical authority or Christian authority supersedes Constitutional authority, they couldn’t be more wrong, (and, I would add, perhaps dangerous). I know that by posting this, I’m preaching to the choir. And I have no intention of launching into arguments that already plaster the Internet regarding why I disagree with the theocratic stance. I’m only writing to address that, to me, it is unwise to ignore a growing group who vocally express a wish to enforce their religion upon the rest of our society. And it is unwise to believe that simply because I’m not feeling particularly offended by something, it’s not potentially threatening or harmful. Did anyone see the early push that Huckabee got in the primaries? Anyone who thinks there isn’t a growing movement for theocracy in the Christian community isn’t paying attention. And anyone who isn’t concerned by that isn’t thinking it through to the end. Even Christians should fear that concept, because, historically speaking, believers haven’t been particularly kind even to other believers when they aren’t in complete doctrinal agreement. I’m not going to slam Obama as a uniquely insensitive or unaware, here. I’m sure Obama isn’t the only person–or politician–to share this sentiment. I actually have heard many atheists say the same thing: “It doesn’t bother me, why get all worked up over it? It’s harmless recitation.” But to that, I have to respond that there is a larger world out there, beyond me and how I feel. And it would be wise of us all to take notice of how others around us “feel,” because we might find they feel that our government should require us to adopt, if not their beliefs, at least their behaviors with regard to their religious perspectives. And they use these seemingly innocuous items to promote that agenda. Since it shouldn’t be there in the first place, by law, is it wise to endorse it, retain it, or defend it as “inoffensive,” while supporters of a U.S. theocracy begin to rally and test their power?